The Amazon anaconda is a reptile and cold-blooded. That means it is the same temperature as the air around it. It is a type of snake called a boa constrictor. Amazon anaconda is one of the largest snakes in the world, the same size as one type of python, and Amazon anaconda can grow to over 37 feet and weigh up to 550 pounds! 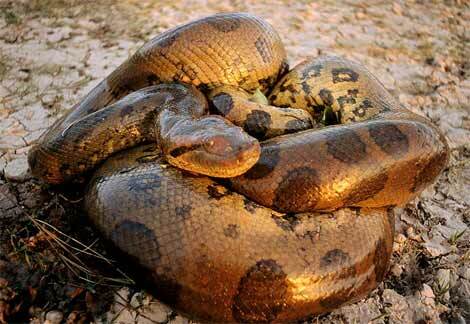 Amazon Rainforest anaconda continue to grow all their lives, getting bigger and bigger each year. Amazon Rainforest Anaconda are carnivores, or meat-eaters. Amazon Rainforest Anaconda eat fish, caimans, deers, birds, ducks and turtles. Amazon Rainforest Anaconda is boa constrictors, which means they squeeze their prey until it cannot breathe. Amazon Rainforest Anacondas also bite their prey with their sharp teeth, hold on with their powerful jaws and pull them under water. The prey may drown. They are nocturnal, which means they hunt at night. They usually wait until their prey comes to them, but they will also hunt. Amazon Rainforest Anaconda swallow their prey whole, head first. They don't chew their food. They have a special organ near their mouth that can sense heat. That is how Anaconda can find animals to eat. Anacondas hide from enemies in the water. Amazon Anacondas can stay under water for 45 minutes. The colors and patterns on their skin help it hide where they live. Amazon Rainforest Anaconda's greatest enemy is humans, who kill them for their skin. Usually they like to stay in the water, but sometimes sun themselves on land. They can live for thirty years. They like to live alone. They give birth to live young; 20 to 100 baby snakes are born at one time. Their nose is on top of their snout, so they can breathe easily when they are in the water. They smell with their tongue. Anacondas have teeth, but they do not have fangs or poison. They only eat once or twice a year.